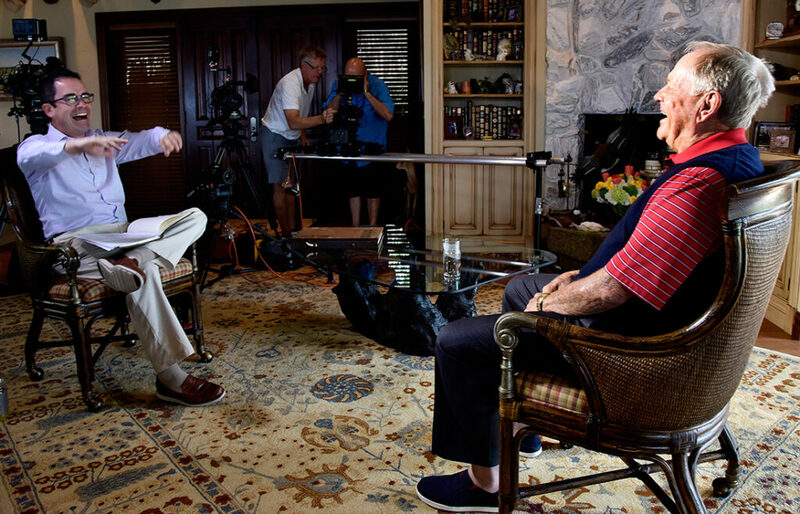 An incredibly impressive list of famous faces are among those scheduled to appear in Golf Films’ Jack, a three-night television event capturing the comprehensive story of record 18-time professional major champion Jack Nicklaus. In addition to appearances from “Greatest of All Time” athletes such as Roger Federer, Wayne Gretzky, Richard Petty, Jerry Rice, Nolan Ryan, Annika Sorenstam, Kelly Slater, and NFL Coaching Legend Bill Belichick. Presidents Donald Trump and George W. Bush will also share their thoughts on the Golden Bear—underlining the Presidential Medal of Freedom recipient’s role as a global ambassador to the sport. The film, which premieres Sunday, April 9, at 9 p.m. ET on Golf Channel following the Masters, is presented with limited commercial interruption by Nationwide. In total, Jack will feature a collection of nearly 100 interviews. Emmy and Golden Globe award-winning actor Tom Selleck will voice Jack after previously narrating Golf Films’ award-winning, three-part critically acclaimed Arnie in 2014 on Arnold Palmer. The product of hundreds of hours of archived film, Jack blends recollections from Nicklaus, as well as a comprehensive roster of fellow sports legends, along with sentiments from Nicklaus’ competitors, business partners, family and longtime friends. Signature moments from a storied career are also included, capturing the essence of an individual who forged a permanent mark as the most accomplished golfer of all time. Part I—Prodigy (Sunday, April 9 – 9 p.m. ET) — Beginning with Nicklaus’ childhood upbringing, and highlighted by the Golden Bear’s relationship with his father, Charlie, and meeting his wife, Barbara, in college at Ohio State, Prodigy covers Nicklaus’ early successes as a professional golfer. Part II—Prime (Monday, April 10 – 9 p.m. ET) — The bulk of his on-course career accolades inside the ropes, including many of his record 18 professional major championships and 73 PGA TOUR victories, are highlighted in Prime. Part III—Pinnacle (Tuesday, April 11 – 9 p.m. ET) — Focusing on the latter half of Nicklaus’ playing career, including his 1978 Open and 1986 Masters victories, Pinnacle also details the priorities he placed on family, his business and philanthropic endeavors—including global golf course design and the Nicklaus Children’s Hospital. Jack utilizes accounts from Nicklaus gathered over 18 months during numerous sit-downs at his South Florida home, and showcases an unprecedented video collection of rarely seen footage from his record 18 professional major championship victories. The film also offers unique, first-hand accounts from individuals on the ground at different vantage points during each respective major victory. A section of the Pinnacle Part III episode additionally poses the question of who is the greatest golfer of all time, Jack Nicklaus or Tiger Woods, and features insight from fellow TOUR professionals and media, including consideration of whether Nicklaus’ record of 18 professional majors will ever be equaled or broken. The film will give viewers a sense of Nicklaus the competitor—offering insight from swing experts on the physical traits that poised him for sustained success—along with an examination from psychologists on his unyielding resolve to finish ahead of his contemporaries. Jack also incorporates collectibles from each of Nicklaus’ 18 major championship victories. Utilizing vintage items collected by Golf Channel to help tell the stories of the Golden Bear’s most identifiable achievements, the included memorabilia spans from his first professional major title at age 22 in the 1962 U.S. Open at Oakmont through his final major at age 46 in the 1986 Masters. As a longtime partner of Nicklaus—as well as the sponsor of his Memorial Tournament on the PGA TOUR—Columbus-based insurance and financial services company Nationwide is the presenting sponsor of Jack, which will allow the three-part film to air with limited commercial interruption. Jack is being produced by Golf Films, led by 13-time Emmy Award-winning coordinating producer Israel DeHerrera. Other award-winning projects produced by Golf Films include ’86, a chronicle of Nicklaus’ final major championship win at the 1986 Masters that aired to coincide with the 30th anniversary of his iconic win; the Emmy-nominated Payne, on the late Payne Stewart; Arnie & Me, a follow-up fourth installment of Arnie; and Ben Crenshaw: A Walk Through Augusta, on the two-time Masters champion and his special relationship with the tournament.